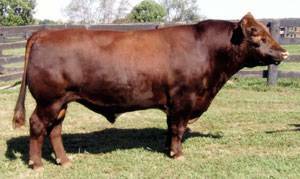 Durango is the outcross pedigree bull who you can use on your heifers and cows. He's polled, red, and TH free. He owns awesome data and yet will produce moderate frame, heavily muscled progeny. He'll work great for purebred and "club calf" use.